﻿ Page 6 - Display Dessert Games - Our Dessert are available for free daily. 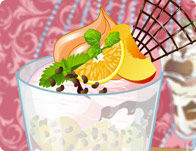 The thought of a yummy dessert often makes a person s mouth water and at 1cookinggames.com there are dessert games online that are great fun to play as you get to create all sorts of amazing looking desserts that have the tastiest flavours ever. You can play these online dessert games with your sister or friend, and have fun with them for hours. Whether its chocolates, ice-creams or more you can be sure to whip some tasty dessert up. So if you re looking for a fun, sweet, and tasty time why not come here to 1cookinggames.com and see what kind of amazing desserts you can create with these online dessert cooking games for girls.